Digital Scrapbook Artist 2 & a giveaway! What it is: Digital Scrapbook Artist 2 is a brand new version of Serif's digital scrapbooking software. Their tag line is "advance digital scrapbooking made easy". I've been digi-scrapping for almost 5 years so I was curious to know whether this lived up to it's claim. I'll preface my comments by saying that I'm a Photoshop CS4 user and am very familiar with both Photoshop and Photoshop Elements. The product installed without any problems (bonus!) and when I started the program I was given the option to start with a theme, start from a blank page or even start with tutorials. The software comes with a number of kits which include papers, embellishment and even pre-made layouts into which you can drop your photos. My first impression of the kits was that they looked really dated. Digital Scrapbook Artist 2 (how I wish it had a nice short name!) features lots of tools for scrapbooking including: Blending and Stencils (both new in version 2), cutting and punching, edge effects, brushes and stitching and filter effects. I played with most of these tools and found some of them to be very easy to use and less so (some a LOT less easy to use) - more on that below. 1. I did like the idea of the pre-made layouts included in the product. I'm sure a lot of beginner digital scrapbookers would like to have a starting off point on which to build. The layouts were customizable - you could move or even remove any item on the layout and add your own embellishments, letters, frames etc. 2. 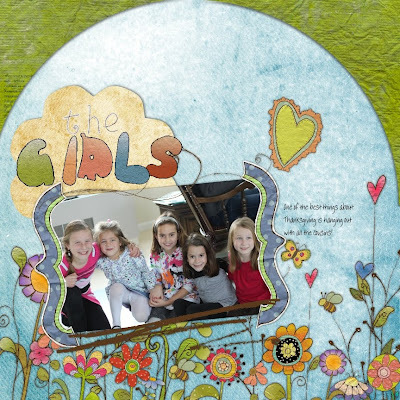 There's an active community of Digital Scrapbook Artist users at Daisy Trail. I found a lot of useful information here when I couldn't find the answer that I needed in the help. There's also YouTube video tutorials linked that are very useful. Additional kits are available here - both free and some for purchase. 3. The price is definitely a key feature - it's considerably cheaper than Photoshop Elements. 1. As I mentioned before I really didn't like the kits that were provided - this is a style preference as I prefer cleaner/less grungy supplies. You can use other kits but I had to do some serious digging to find out how to do it! 2. Even though some aspects of the program are very easy to use I found a simple concept like cutting paper in a rectangle to be very frustrating. My knowledge of Photoshop could have been a hindrance here. 3. Although the product does use the concept of layers, I found the implementation to be confusing. The layers contain multiple items and it felt like I had less control over what I was doing as opposed to Photoshop. This would probably not be an issue for a new digital scrapbooker. I started with one of the pre-made layouts, dropping in my photo. I also added the title using my journaling and re-arranged some of the layers. The kit and the layout itself are not my typical style but I was able to finish this in about 15 minutes, never having used the software before. Next I tried to take advantage of some of the advanced features in the product - specifically I used the new blend modes to create photo-blended background. I did get a little frustrated with the limitations of this, but part of that could be due to my lack of experience with the product. I've used similar techniques in Photoshop but was unable to translate it exactly with this product. Finally I used some of my own digital kits. I was able to import papers, frames, word art and embellishments into Digital Scrapbook Artist without any trouble (once I figured out how to do it that is!). I made the heart embellishement here using stencils and effects, picking the color from the patterned paper. Finally I was starting to have some fun with the software! If you are a digital scrapbooker do you see yourself ever wanting to use this product? If you are not a digi-scrapper would this make you want to try? 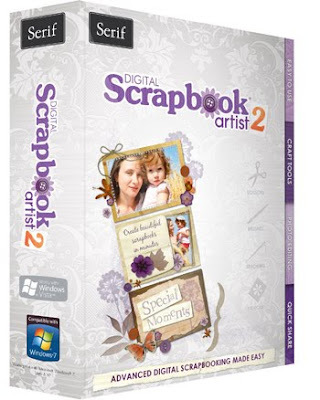 Leave your comment by noon EST Tuesday to be entered to win your very own copy of Digital Scrapbook Artist 2! I tried digital scrapping for about 10 minutes once, using a software that came with an album I purchased - didn't have the patience to try to figure it out. I don't know if this software would be any better or not, but I would certainly give it a try - if I can figure it out, then anybody can! I haven't tried digi-scrapbooking yet. Like the idea of it all being inside of my computer = less mess. Thanks for the chance. Thanks for the review of this program. I saw it advertised and thought the new features would make this more of a possibility to beginning scrappers but now I'm not sold on it! I also use PS CS4 to scrap but teach (IRL) digital scrapbooking using Photoshop Elements. I've never done digital scrapbooking and don't know if I would ever go to it full time (I love touching papers and playing too much), but I have wanted to try some hybrid items. I'm curious about this program. I really like digi scrapping it is a lot quicker. 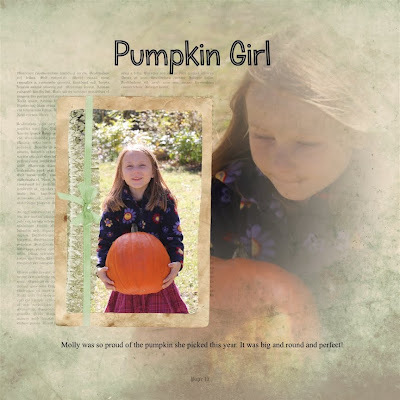 I really like your pumpkin girl page alot! Great Job! I'm not a digi scrapbooker but I wouldn't mind giving it a try. This software looks interesting. I haven't tried digital scrapbooking yet. This does looking interesting. I am not a digital scrapbooker but would be willing to give it a try. Who knows maybe I would even like it. Thanks for the review. God bless! I am slowly making my way over to digi scrapbooking. I would love to give this software a try. Thanks for the chance to win. As a digital scrapbooker (and a paper one) I am always willing to give anything a try. This program looks fantastic and I am inspired completely by your Kiss, hold, love, smooch, hug page. Thanks for this opportunity. love your wedding page & would love to try this - i'm not digital yet! I tried Digi over a year ago and have enjoyed it. I currently use PSE 5 and although there is a curve, I do find it useful! If DSA2 is a little less complicated and will get me to complete more LO's in a shorter time, I'd be willing to give it a go! I have not yet tried Digital Scrapbooking. I am currently finishing up a few conventional scrapbooks. Once I finish those I really think I am DONE. Now that photos are digital I will keep them neatly organized in my Creative Memories Memory Manager software, and will only print up the picture I will put in frames, etc. Sometimes I feel pressured to get the scrap book finished and it becomes a chore. The digital scrapbook software may be a great in-between for me. I could scrapbook virtually and not have to actually place the pages in a book. Sounds Great! I haven't tried digital scrap booking yet. I like the idea of having software with kits of papers and elements to get me started. I think this is a great starter for the "digitally impaired" like myself! I've tinkered a little in Photoshop, but mainly just use it to crop/resize and touch-up photos and not really scrapbook. I'm a little intimidated, I think. Plus maybe afraid I'd like it and give up "paper" scrapping... I'd love to give this software a try!! Thanks for the giveaway! I've wanted to try digi scrapping, but I'm very intimidated by the whole idea of it. Haven't tried digi yet. I have been on the fence about purchasing Photoshop Elements. I was glad to see this review of another option. I'd love to give it a try. Thanks! i've done just a couple of digi layouts! this would be something i would consider! I am def. wanting to try to go DIGITAL for my scrapbooking needs! I would love to learn more about technology--while scrapbking! Thanks for the chance to win! Actually this software may get me into digi scrapping after all. I love it when software is very specific...Thanks so much! I would love to try my crafty hand at digi-scrapping. fingers crossed! I played around with digi for a few minutes one day and only got frustrated. I would love to win this so I could maybe have a better starting point. This does sound like a good starting point for someone like me who has been tempted to learn digi, but is very cautious about investing a lot of money or getting software that may be so powerful that I'd never need all it could do. Since professionals use Photoshop, I don't think I'd would want to start there. Thanks for your review and the chance to win.